Are you looking for an awesome sounding piano? Are you looking for an awesome playing musician? That piano could already be in your home; it just hasn’t been tuned. You’re an awesome musician; but your piano might be hiding how you really sound – AWESOME! A piano that has not been tuned for a year or more may sound okay to you; but when it is finally tuned again, that’s when you realize what you’ve been missing; MUSIC. Piano music that is crystal clear and pleasant to the ears. Trained ears or not, most people cannot tell when a piano needs tuning; but most people can tell that it sounds better after the tuning. Music plays an important role in many peoples’ lives. A piano that sounds good and plays well is what makes music that much more enjoyable. Most people agree that nothing can compare to the sound of the piano in making music. My business is in the making of any piano to sound and play its’ best. That’s why I recommend that every piano receives at least one tuning each year; so that music is always an inspiration to the one practicing the piano. My current customers all enjoy the benefits of my services. They receive professional and concert quality tuning at a price lower than most. Appointments are catered to their schedules and are on time. 1. Action regulation – a term meaning simply the adjusting of all 88 notes to play at optimal performance to touch response and tone. 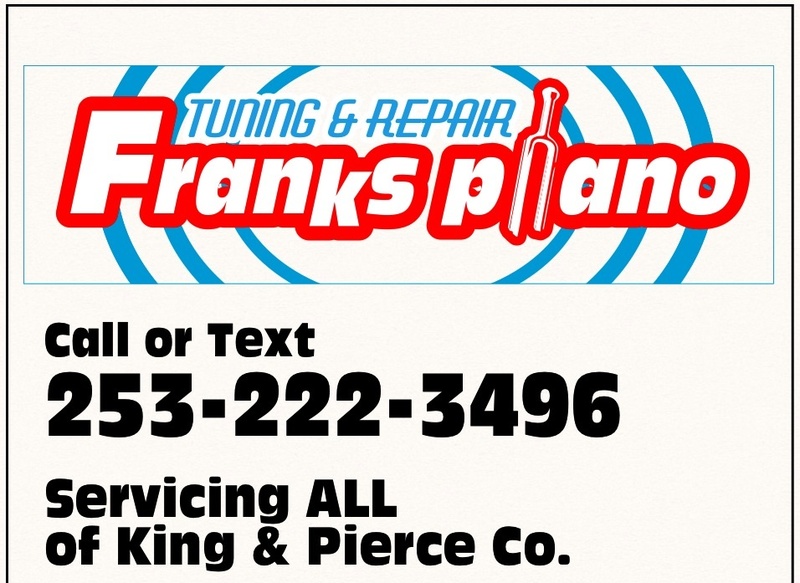 If your piano is in Pierce County, King County, Thurston County, or Kitsap County, the tuning rate is the same. I accept cash, check or credit card for payment. When you schedule an appointment, I will be on time; or I will call to notify you of any changes to the schedule due to traffic or other delays. I look forward to meeting you and earning your business.